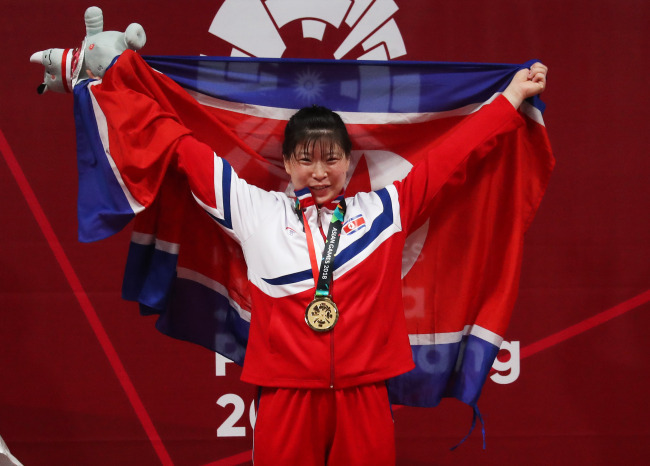 JAKARTA, (AFP) - The 2019 Asian Youth and Junior Weightlifting Championships will be held in the North Korean capital Pyongyang, signal that the secretive country may be coming in from the sporting cold. At the Asian Games weightlifting in Jakarta, which North Korea have dominated winning seven golds, the Asian Weightlifting Federation and North Korea's Sports Minister Kim Il Guk signed an agreement Sunday for North Korea to hold the championships from October 27 next year. North Korean sports administrators have been hoping the country would be able to host international events after combining with South Korea in several sports at this year's Winter Olympics and Asian Games, and also marching under one flag at the opening ceremony. North Korea was left isolated and subject to UN Security Council sanctions over its nuclear weapons and ballistic missile programmes, meaning it lost the right to hold the 2018 Junior World Weightlifting Championships. This year's Youth Junior World Judo Championships were also pulled from Pyongyang before a thaw in relations, culminating in the June summit between US President Donald Trump and North Korean leader Kim Jong-un in Singapore.